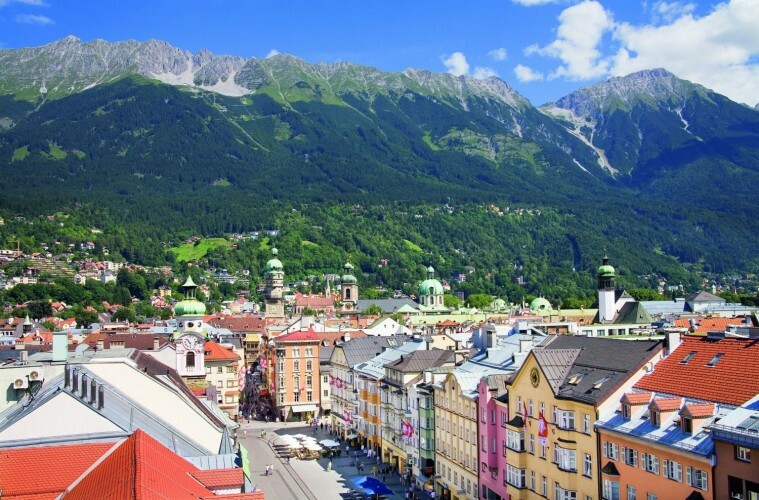 Innsbruck lies in the western part of Austria, nestled in the Inn Valley. The town’s name in English translates to “Inn bridge”, and is a well-known spot as it hosted the Winter Olympics and the Winter Paralympics. 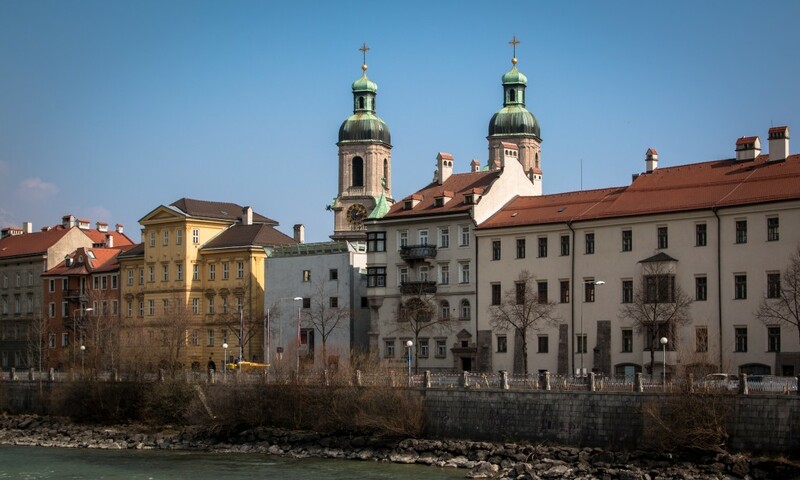 Innsbruck was an important Roman trade route in the 4th century and in the 15th century the town flourished as a center of culture and politics in Europe, merit of the Emperor Maximilian I, who was a resident of Innsbruck at that time. Another key moment of the town’s history was the victory of Andreas Hofer, an insurgent who headed a peasant army during the Napoleonic invasion. These are just a few of the many events that make up this city’s rich history. The Golden Roof, or Goldenes Dachl is the town’s central landmark. 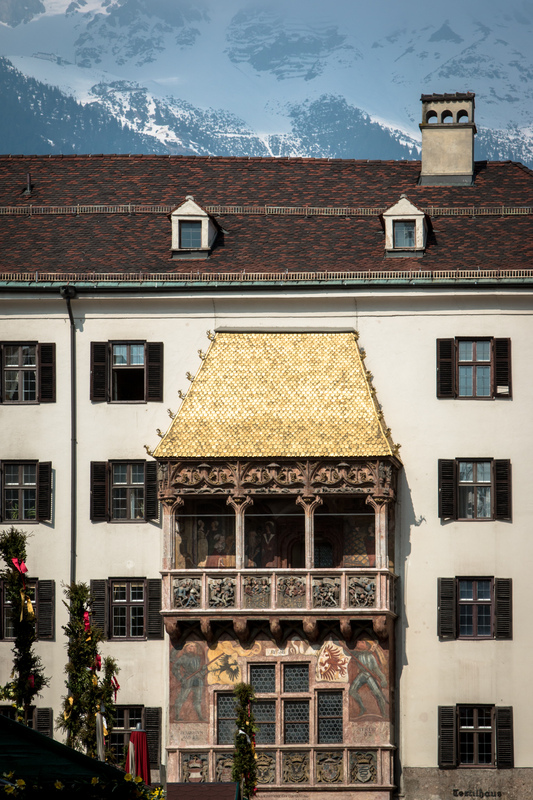 As you make your way around town it is hard to miss this intricately decorated balcony and its fire-gilded copper roof tiles with its golden glow, which was used by the Emperor Maximilian I and his wife to view events that took place in the town square. The Golden Roof contains a museum that is open to the public and visitors can also enjoy the view of the Old Town from the balcony. Across from the Golden Roof you will notice the Helblinghaus, a characteristic building embellished with Rococo stucco decorations. It was originally constructed as a townhouse in the 15th century but undertook significant changes in its architectural style until its completion in the 18th century. It takes its name from Sebastian Helbling, a former owner of the building in the 1800’s. If you want to observe the skyline of Innsbruck you can do so from the city tower or Stadtturm, a former watch tower that was used to protect the town from fires and other possible threats. 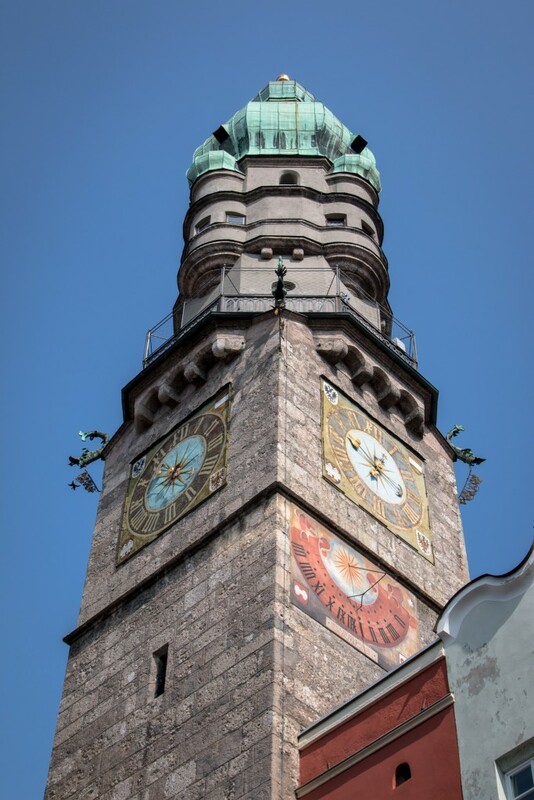 The 51 meter tall city tower was built 50 years before the Golden Roof, and has been standing looking over the town since 1450. 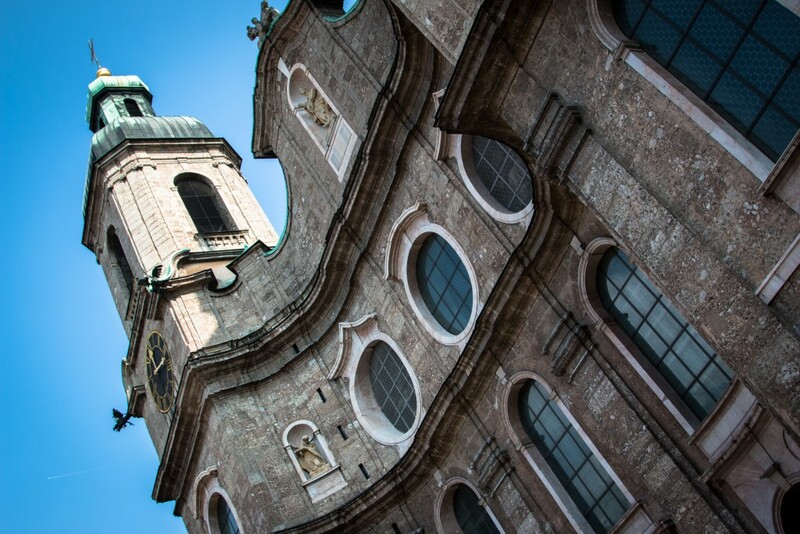 Innsbruck Cathedral, or the Cathedral of St. James originally dates back to the 18th century. However, the cathedral was fully restored after suffering heavy bombings during World War II. From the distance as you approach the cathedral you will immediately notice its two distinctive bell towers and as you wander inside you can examine its impressive Baroque interior. After having taken a walk around the Old Town, passing through one of the passageways of the town’s defensive walls you will find yourself standing in front of the Imperial Palace, or Hofburg. Built in the 15th century, it is one of the few iconic buildings of the country. Nowadays the previous imperial palace is a museum containing five themed sections that illustrates its important role in history. Innsbruck offers a variety of lodgings for all budgets. 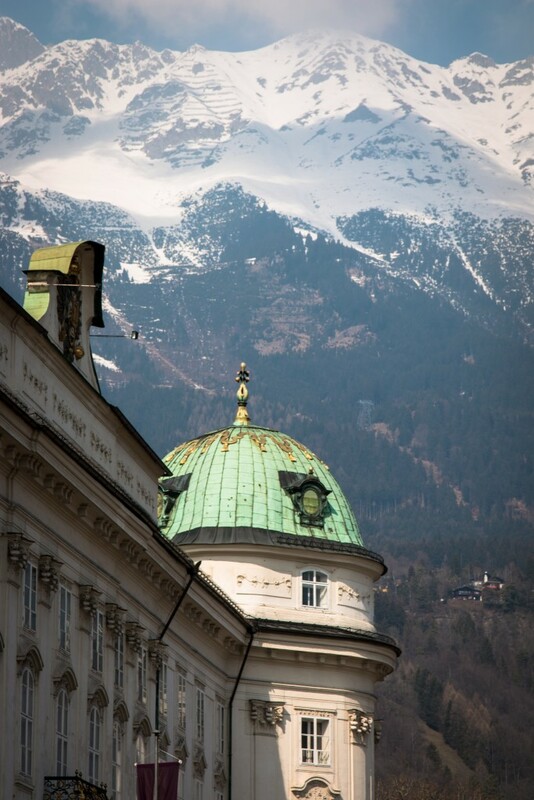 The delightful Hotel Innsbruck is just around from the Old Town and by the bank of the river Inn. 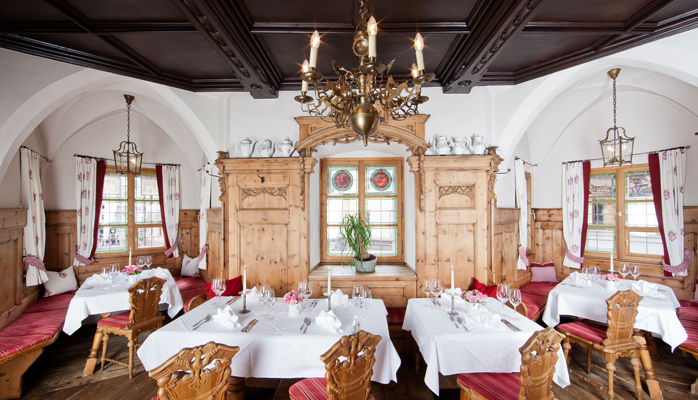 For a romantic evening in the Old Town you can dine at the Ottoburg, a restaurant located inside a medieval tower house which offers traditional Tyrolean dishes with the backdrop of the river Inn with the Nordkette mountain range or the Golden Roof. 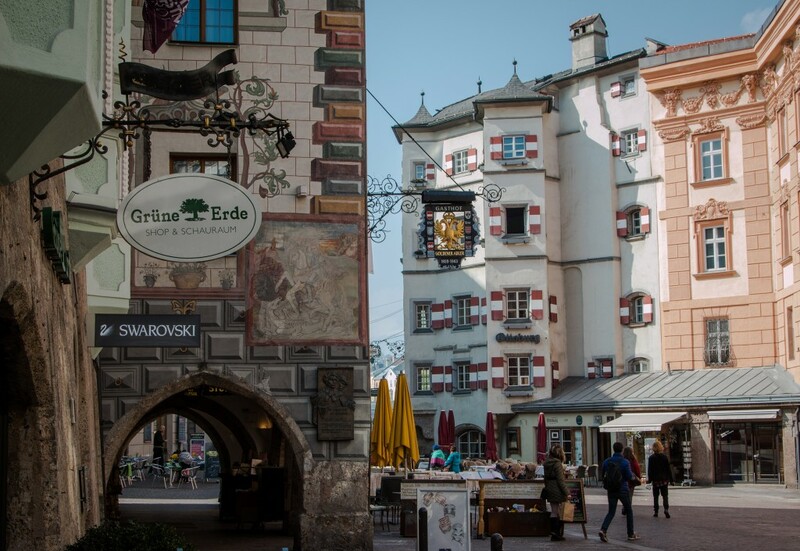 While Innsbruck isn’t your typical vacation spot, it offers a rich history and beautiful scenery that is worth exploring. ** All photos are the writers own unless otherwise noted.